Focused care to best meet your individual needs. The Board Certified Surgeons of Surgical Associates of Neenah, have the training and experience for the diagnosis and treatment of benign and malignant breast disease, hernia repairs, abdominal surgery involving the colon, intestines, pancreas, gallbladder or appendix, colorectal surgery, thyroid and parathyroid surgery, and benign and malignant skin lesions. Ours is a team approach. 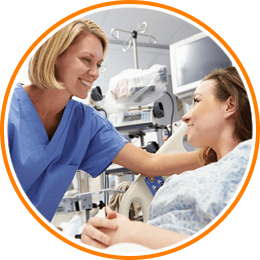 We work together with patients, their families, other physicians and health care providers to provide inpatient and outpatient surgical services that best meet your individual needs. Each of our surgeons is credentialed in laparoscopic surgery. Each is skilled and experienced in the evaluation and treatment of various acute and chronic surgical conditions, as well as, surgical oncology and the surgical management and treatment of cancer. As general surgeons, our Board Certified Surgeons have training and experience with numerous surgeries including those listed below. The most common abdominal procedures are removal of the appendix, removal of the gallbladder, colon surgery, hernia repairs of all types, heartburn surgery and exploratory surgery to diagnose medical conditions. Most of these surgeries are done laparoscopically. Our surgeons offer a number of surgical procedures including percutaneous biopsies, fine needle aspiration, core needle biopsies, lumpectomies, mastectomies, chemotherapy and radiation therapy. During these procedures, we physically remove all or part of the cancer. Your doctor uses cancer surgery for the purpose of diagnosing, treating or relieving symptoms that the cancer may cause. Our surgeons offer thyroidectomy and parathyroidectomy procedures. Endoscopic procedures allow the surgeon to view the inside of the upper and lower portions of the digestive tract through a small scope attached to a video monitor. We have numerous surgical options available depending upon the type of hemorrhoid problem you have. This surgery uses a tiny camera to operate inside the body through a small lighted telescope connected to a video monitor. Because incisions are very small, laparoscopic surgery usually means outpatient surgery and a faster recovery time. Our surgeons offer biopsies to help determine the reason for enlarged nodes. These cysts can be small, but they are quite painful, making day-to-day life difficult. We offer incision and excision procedures to remedy the problem. Our surgeons offer treatment for melanoma as well as basal cell and squamous cell carcinoma. This includes Lipomas, Sebaceous cysts and other soft tissue tumors that can often be removed in the office using local anesthesia. Thoracic surgery is the field of medicine involved with the surgical care of the chest cavity (Thorax). Vascular surgery is a specialized field dealing with the disease of the arteries and veins of the neck, abdomen and lower extremities.